Writers should be treated like rubber plants: lightly pruned, occasionally watered, but basically left to do their own thing in a corner, away from direct sunlight. Every time I had to gear up for a book-related event this week, I thought of that quote. I mean, I wrote the book already --- now I have to go talk about it? Which is mostly the childish trepidation talking, but still. It'd be nice if one could just release one's books into the wild and let them find their own way, but that's not how the business works. So --- to business it was. I summed up most of the highlights on our book blog earlier today. I'd optimistically planned to post event updates within a day of each event, but completely failed to account for post-event fatigue, which is why even this blog is only being updated right now (and I'm still short of sleep). I can't imagine how authors on proper cross-country book tours keep up the momentum. In between all that, I was reading New York Times reporter David Rohde's five-part account of his kidnapping and captivity by the Taliban, watching the awesome Intel "Sponsors of Tomorrow" TV ads, reading Suchen Christine Lim's Rice Bowl and playing with Tweetie (despite sangsara's best evangelisation efforts, I'm still not sure if I want to start Twittering again). Oh, and doing some pay copy work too. Plenty more ideas swirling around in the old noggin, but it'll be a couple more weeks before I can sit down and think about them properly. Meanwhile, two more book events, ho! Whee! 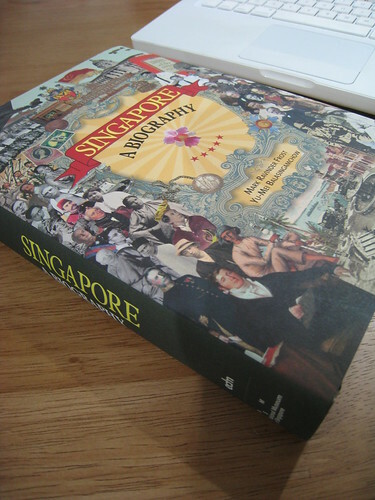 My very first copy of Singapore: A Biography. Now I have an actual book to show off and paw and fuss over, not just the cover art (which is very eye-catching in its own right). The book will be in Singapore bookstores from next week. Don't let its heft put you off. It's eminently readable, gorgeously illustrated and does not once refer to Singapore as a "little red dot" (although someone's "little red book" makes an appearance, and I don't mean Mao Zedong). Not every day is about writing.. Today was about scratching things off my to-do list, which is scribbled in ballpoint ink on a piece of used paper. Called my mom 'cause it's her birthday. Yay, Mom! Made loose plans to meet a Lonely Planet writer who'll be in town next week. Made loose plans to meet one of my best friends' boyfriends who'll be in town next week too. Sent out an email reminder to a rather long list of friends and associates about the upcoming book launch events (which kick off on Sunday at the National Library --- are you gonna be there or what?). Fortunately I didn't break my Gmail doing it. Secured a good freelance writing/editing partner for a small job next month that I don't have the time to do on my own (yay for pay copy). Turned down another copywriting job that totally doesn't interest me. Shilled for the book at the National Education mothership of Singapore. Contemplated the niceties of starting a Facebook Fan page for Singapore: A Biography, considering the book is still at the printer's and will only be in bookstores next week (but you can buy it at the National Library event on Sunday). Made loose plans to meet a couple of Singapore writers at the opening of the Singapore Writers Festival. Emailed some contacts for a Vietnam trip next month. Compiled a bunch of information for a government tender and updated a proposal document that one of my collaborators drafted. Attempted to do a friend a favour and play around with the new Raffles Alumni website, but there was only so much I could do when it didn't send me my password. Daydreamed (although we did this after dinner and via IM) with a good friend about the Really Cool Business we're going to set up --- someday. Ignored Ink whining for more food because he's had his full ration for the day. Bought more bandwidth for the Singapore: A Biography website (I suspect there's a not quite optimised-for-web image that's doing us in). Scratched Sisu's head till she stopped whining at me (after lunch and now, as I'm typing this in bed). Avoided finishing that essay I started a few weeks ago.